Pequis (ca. 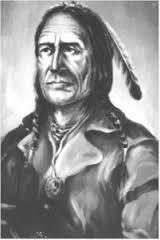 1774 – 28 September 1864) was a Saulteaux chief, who moved from the Great Lakes area to Red Lake (now in Minnesota), then arriving in what is now southern Manitoba in the 1790s. In 1817 he signed the first treaty with Lord Selkirk, granting land along the Red River to the Selkirk settlers. In 1840 he was one of the early western First Nations converts to Christianity and was given the baptized name William King; his children adopted the surname “Prince”. He and his people had helped both the Hudson’s Bay Company and the Selkirk settlers; indeed, without Peguis’ help, the Selkirk settlers might well have starved.However, by the 1850s he had become concerned at illegal settlement by European migrants on traditional lands. He was sometimes called “Cut Nose” since his nose had been injured in a fight in 1802. Peguis monument at Kildonan Park, Winnipeg. A conventional representation, since no portrait was made in life. His name is commemorated in the name of Peguis First Nation, Winnipeg Route 17 also known as the Chief Peguis Trail, and many organizations, place names, and institutions of Manitoba.